Confused by all these new laws and what makes an AR-15 “featureless” so you might not have to register it as an assault weapon (AW)? 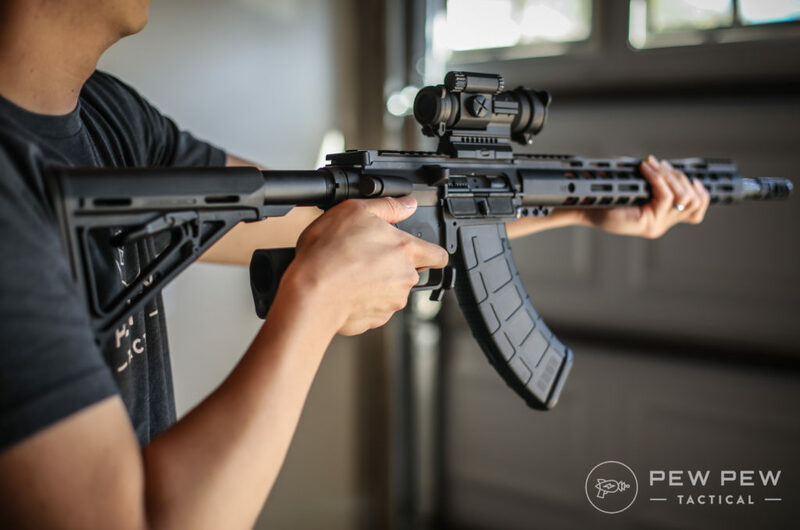 A featureless rifle allows the use of detachable magazines and lawfully owned standard-capacity magazines. A little confused? We’ve got you covered. 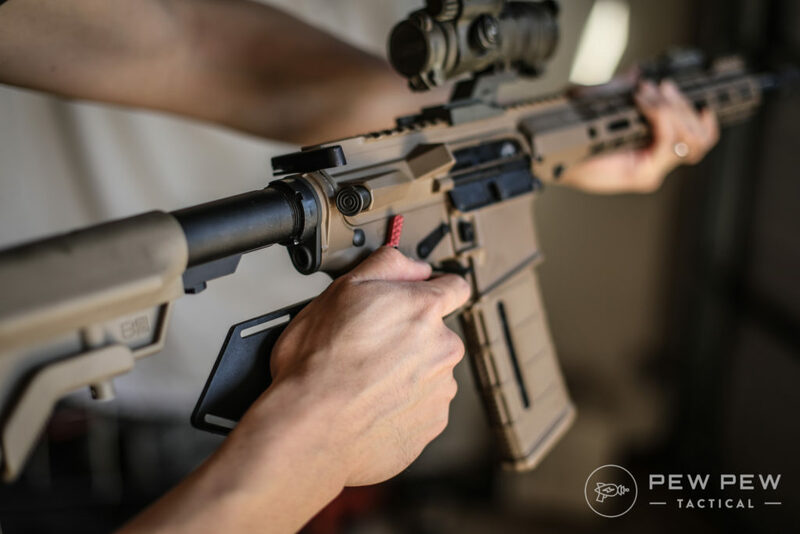 Learn exactly what makes an AR-15 “featureless,” how it allows the use of the magazine release and larger magazines, and how to build one with recommendations for appropriate grips, stocks, and muzzle devices. 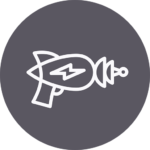 Plus if it all sounds too difficult…the best new “Bullet Buttons” that let you have all the features. 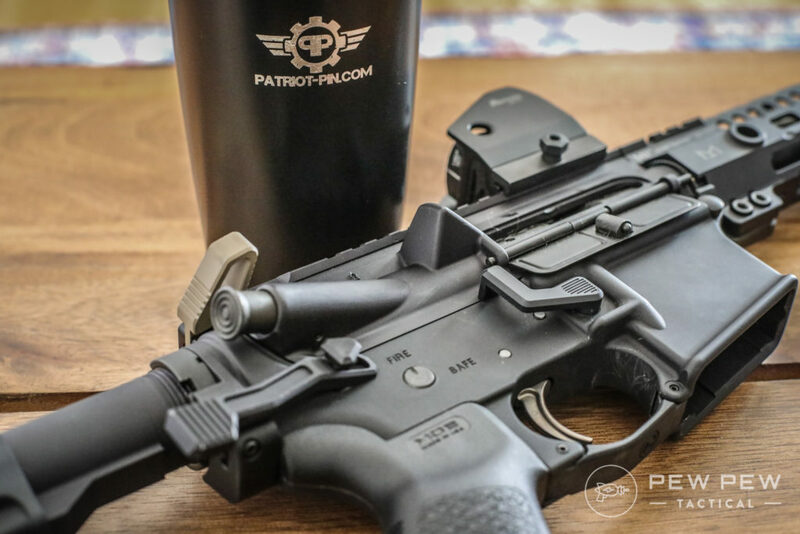 Hint…it’s the AR MagLock + Patriot Pin combo. Disclaimer that this is not legal advice and you should double-check everything, especially since the laws surrounding this always seem to be in flux. I’m also writing this mostly towards residents in California, but New York residents can also benefit. 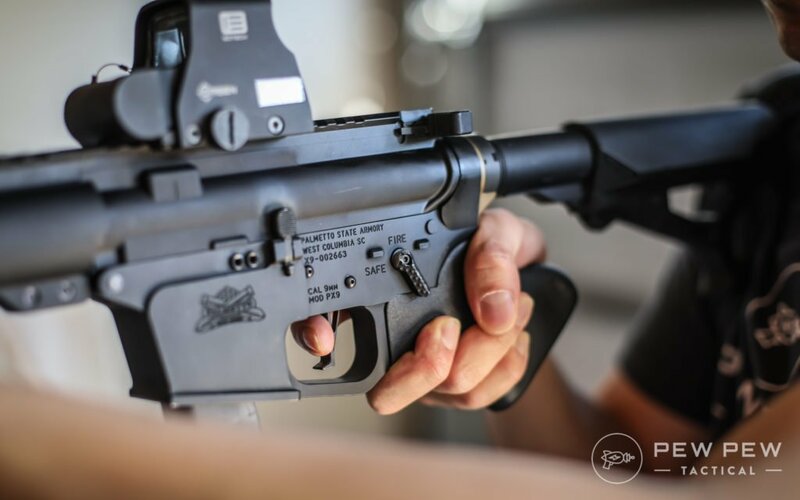 First, let’s go over what makes an AR “featureless” before diving into the laws. 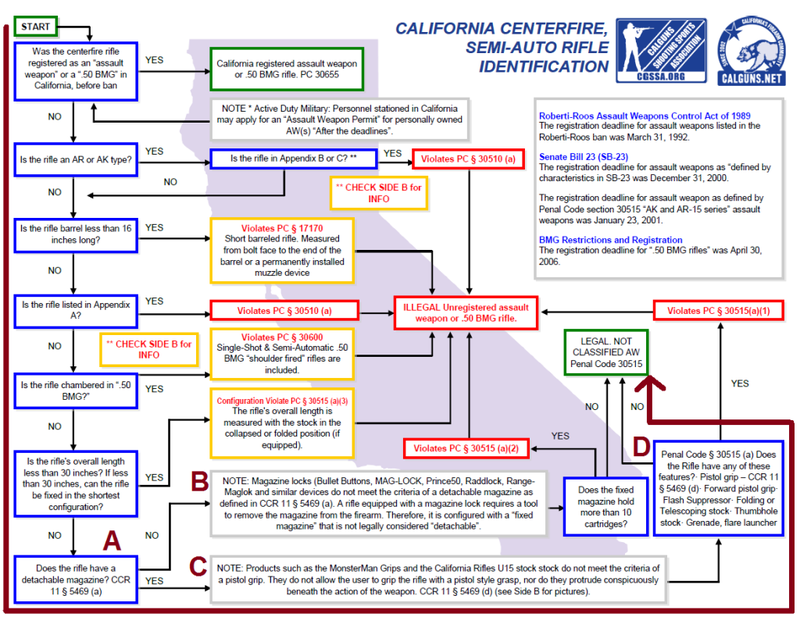 This flowchart from Calguns.net is perfect for making sure your semi-auto centerfire rifle is legal. This works for other semi-auto centerfire rifles but I’m using the example of the AR-15 since it’s the most popular. Start: Begin here and if you bought your rifle at a legit FFL, it should pass everything with flying colors as you move down with the brown line. 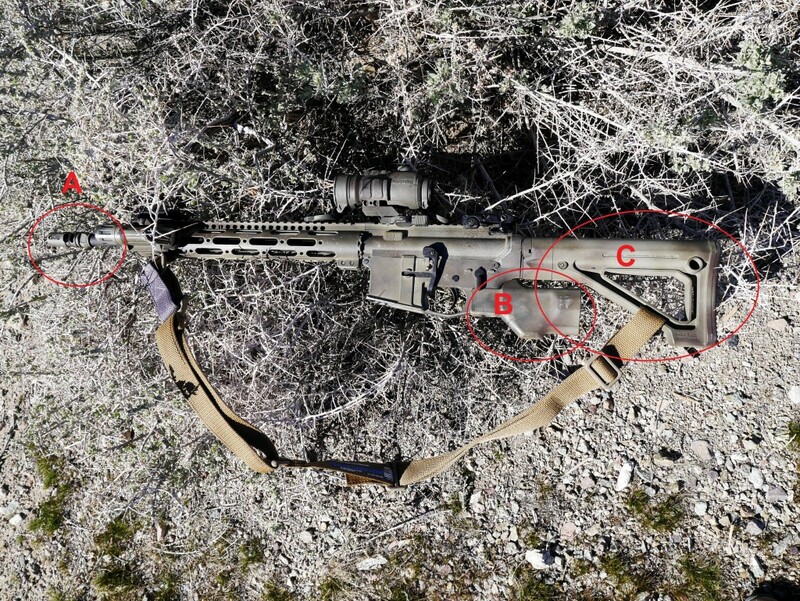 Section A: Here is where it gets interesting for rifles…whether or not it can have a detachable magazine. 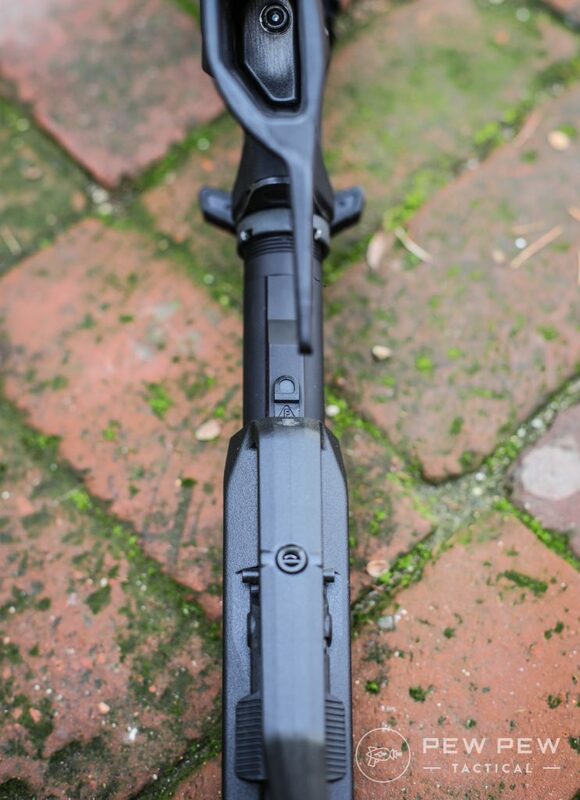 Most FFL bought new rifles take the “No” detachable magazine path to Section B. 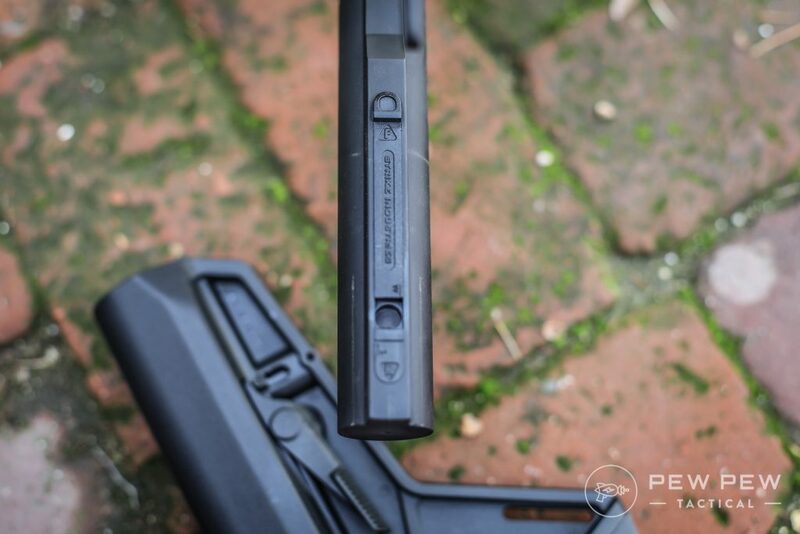 Section B: You might have heard of the term “bullet button” which is just a branded name for magazine locks that require a tool (and a bullet is considered a “tool”) to remove the magazine. When you just use your finger…you cannot release the magazine like normal. The .gif shows some ingenuity in adding a little protrusion to the bottom of a magazine to active the bullet button. Past 2018 you’ll need more than a simple tool…read on! Section C+D: This is where “featureless” comes into play since we will not have the features dictated in CCR 11 § 5469 and Penal Code § 30515. What you see on all normal AR-15’s. It allows you to hold it in a pistol fashion where the web between the thumb and the finger rests below the exposed trigger when firing. Yea…I had to think about that for a minute too. 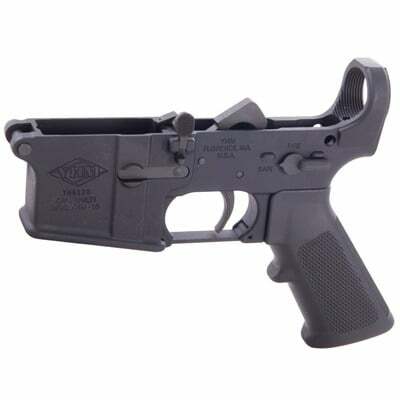 This monstrosity below is an example of a thumbhole stock where the thumb of the trigger hand can go through the stock when firing. The folding stock allows you to fold the stock over to the side so the overall gun is much smaller when not in use. 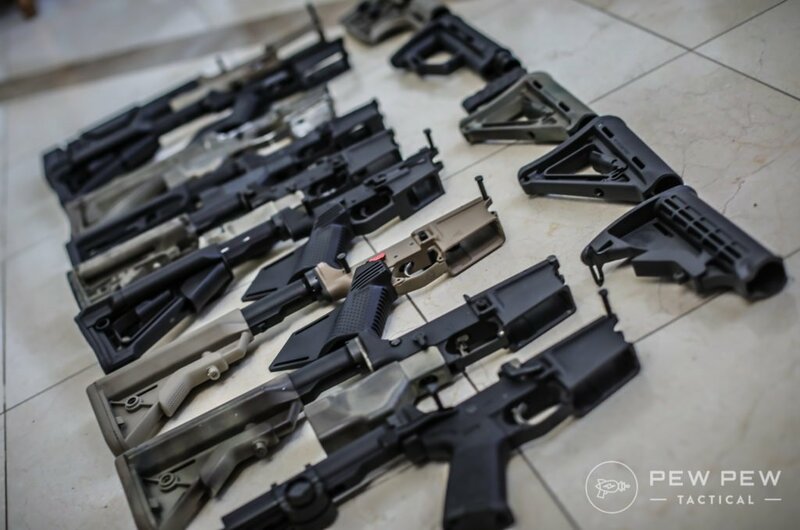 While the telescoping stock is very standard and more often known as a collapsible stock. Device attached to the front muzzle that reduces the flash from shooting. They are mostly for preventing the user being blinded by the flash at night, rather than hiding the flash from spectators, although that happens too. 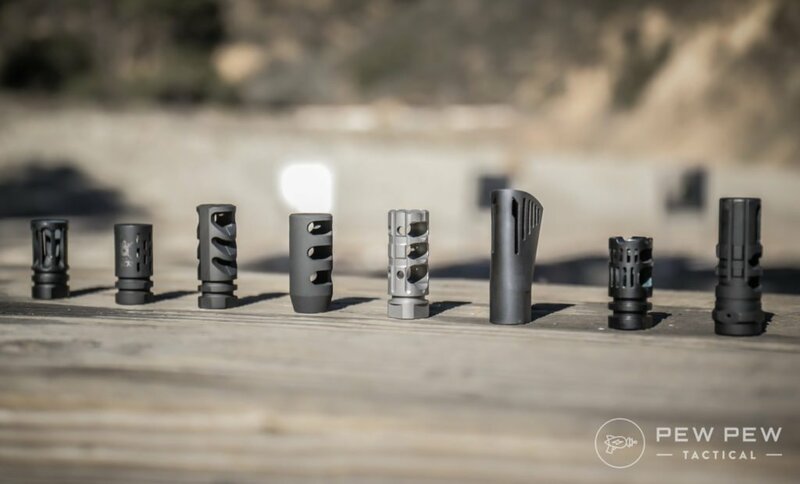 There’s a lot of muzzle devices, and the big difference is that flash suppressors have a bigger cavity at the exit end than the bullet caliber when compared to muzzle breaks or compensators. 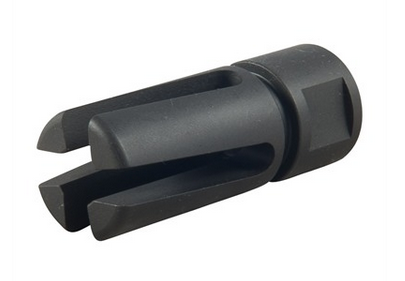 Flash suppressors usually come in two flavors…birdcage and multi-prong. 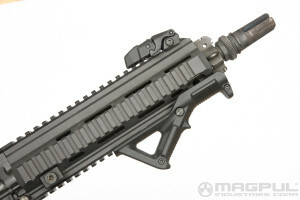 Commonly known as the vertical foregrip since they can be grasped in a pistol-like fashion. Why Would I Want a Featureless Rifle? 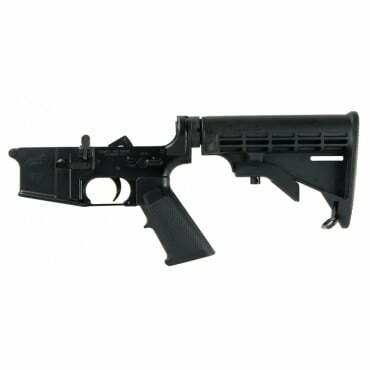 Seems like you miss out on a lot of cool stuff, so why would you want a featureless AR-15? The big reason was hidden above in Section A…the ability to not have a bullet button and use your magazine release as it was intended. And for those who have standard/high-capacity magazines, you are only allowed to use them in “featureless” builds. Bullet-button rifles have a maximum of 10 round magazines. However, this is set to change in California with the new Gunmageddon Laws. Now the primary bonus of making a featureless rifle is so you do not have to register it as an assault weapon. Those standard/high-cap magazines I talked about above…they were scheduled to become illegal in CA on July 1, 2017 but the law was blocked by a judge. Again, I’m not a lawyer and this is not legal advice. Also, this doesn’t cover all the “Gunmageddon Laws,” just the main ones that deal with AR-15’s and featureless rifles. As of January 1, 2017, you can no longer buy/make/import the standard bullet-buttoned AR-15 as we know it since it is now an assault rifle. The definition of a “fixed magazine” was changed from having to use a tool to something that requires disassembly of the firearm action. For those of you who got one before…you have until January 1, 2018 to either register it as an assault weapon or make it featureless. Or you can also surrender it, sell it outside of CA, etc…basically stuff you probably don’t want to do. Registration is here and costs around $20. If you register, there’s all sorts of fun things that come along with it…travel restrictions, inability to sell in CA, inability to lend, inability to transfer to a family member even if you die, etc. Essentially it will die with you. However, if you make a registered assault weapon (RAW) into a featureless one, you should be able to “de-register” it later. You can avoid registering as an assault weapon if it no longer meets the requirements…aka a “featureless” build. Find out how to do that after this law section. You should also be able to keep the evil features and not register if you adhere to the new definition of “fixed magazine”…aka use one of the new bullet buttons that require disassembly of the action such as the ARMagLock and Patriot Pin. No more a simple pin into the bullet button. 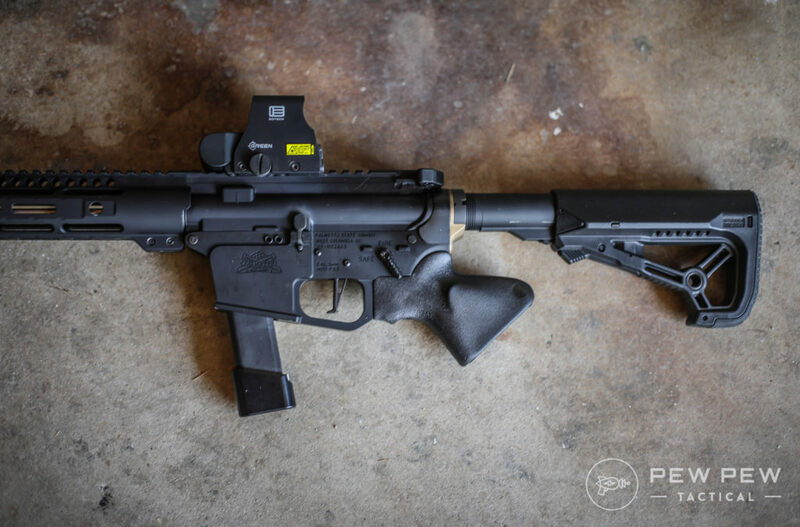 AR pistols must follow the new laws PLUS not have a threaded barrel nor handguards. 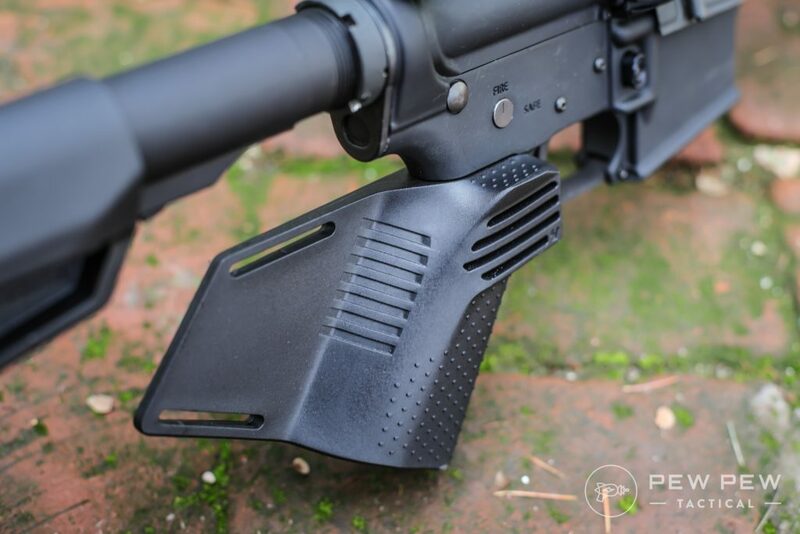 So you’ll have to pin/weld an approved muzzle device and somehow not have handguards. Basically…you’ll have to register or use the new type of bullet button. 80% builds are still legal. But you have to stay afloat the new laws. Any new builds cannot be made into an AW. AB 857 requires that by Jan 1, 2019 all completed firearms have a serial number. If you engrave prior to July 1, 2018, you do not need to notify any government entity. But if you do it after, you’ll have to apply to the state (pay fees, get a serial number, etc). More info here. Ready to build or upgrade (or rather…downgrade) to one? Let’s go through each of the features again with our suggestions of how to make them compliant. On the easier side to fix…just don’t have one and pick up a thread protector. 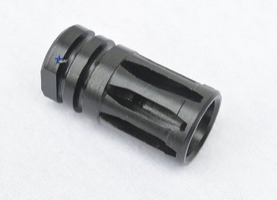 Or opt for a muzzle brake/compensator instead. If it talks about flash hiding or suppressing in the description, just err on the safe side and don’t get it. If you want something with the best recoil reduction and least reticle movement…look at the Precision Armament M4-72 Severe Duty. See it in action for side blast, decibel reading, and reticle movement. 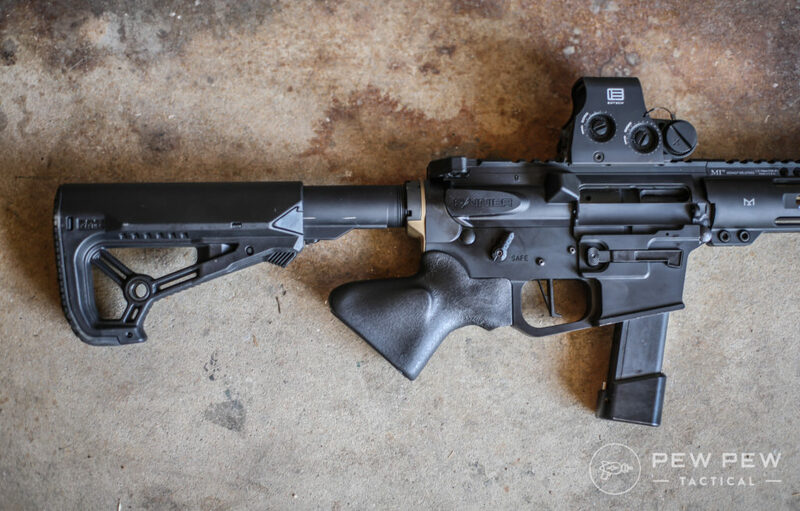 If you want something a little more budget but still effective, check out the Miculek Brake. Lastly, the best hybrid brake/compensator goes to the VG6 Gamma. 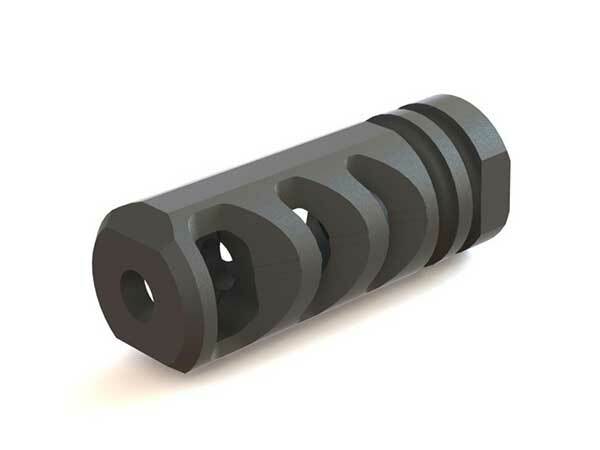 Check out the rest (and even more videos) in our Best AR-15 Muzzle Brakes & Compensators article. 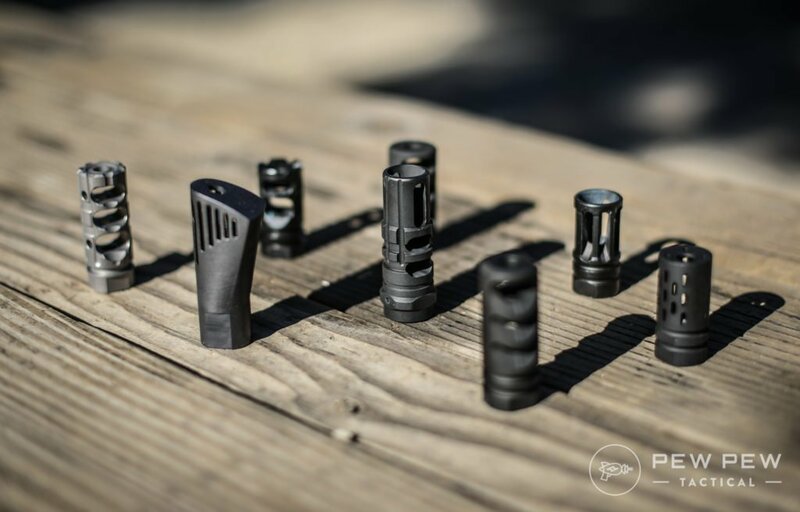 The biggest aesthetic and functional change you’ll do in your quest to go featureless. It might look odd/ugly, but I’ve found that I quickly adapted to the different grip. The Hammerhead is what I used in most of my beginning featureless builds since it lets you have a hunting rifle grip. Great for regular or precision shooting…but once you start running and gunning, the lack of having your thumb on the opposite side slows you down. Unless you’re strictly against fin-type grips or are on a tight budget…there’s better options out there now. The MegaFin adds a very nice thumbshelf for right-handed shooters that gives you a lot more control. However, if you want easy access to the safety lever, you’ll likely need an ambidextrous safety like the Seekins used that is turned the opposite way. Here it is in action…easy to engage and safety. And great for running and gunning. One of my top recommendations. My current favorite featureless grip is the Resurgent Arms. The awesome thing is that you can get your thumb around the grip which gives almost the same control as a regular pistol grip. You can also flick the safety lever from this position but unless you have a very extended version (Resurgent is coming out with one), it’s hard to re-engage. Another thing is that the regular end plate is sharp against your thumb web. I tried using some duct tape and it felt fine. But Resurgent also has a beveled plate which is super comfy (but $35). It’s the gold thing below. Lastly, the length of pull is increased slightly because of the grip. Unless you have super short fingers you should still be fine. All in all…my shooting speed is almost the same as with a regular pistol grip. 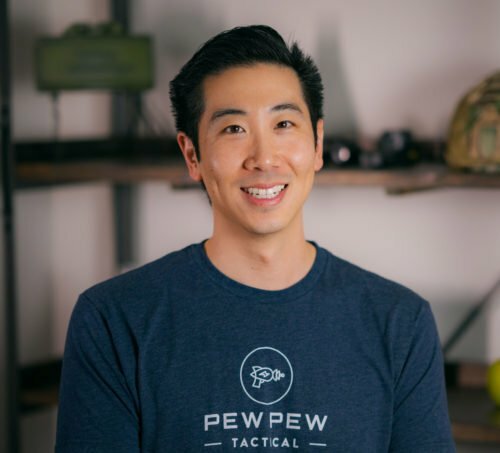 I reached out to Resurgent and they are offering Pew Pew Tactical readers a 10% off coupon with code “PEWPEW10“. 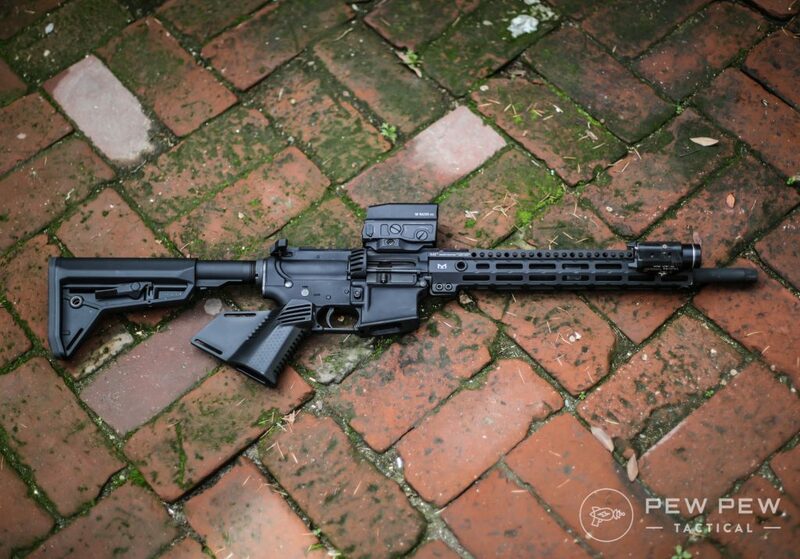 What’s your take on the Resurgent Arms grip? 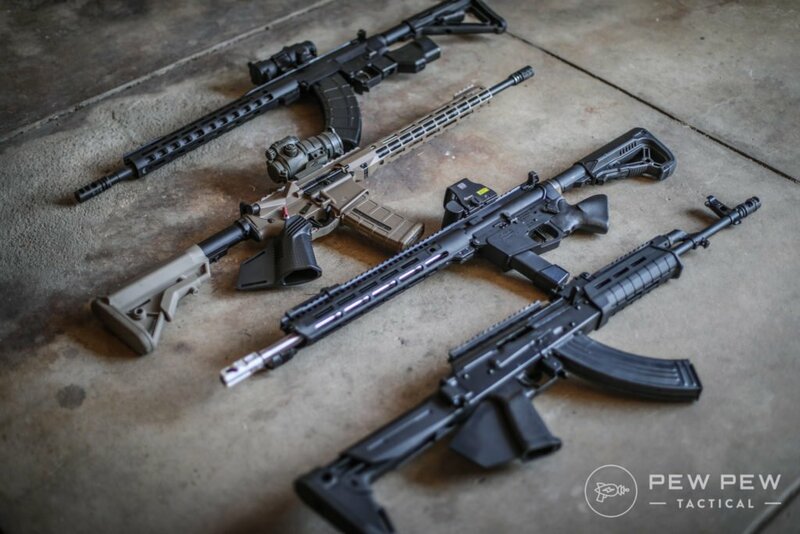 See even more Featureless Grips for the AR & AK in our full roundup. Many internet people say you can blind pin and epoxy your current collapsible stock so that it can no longer move, but again, I like to err on the safe side with a fixed stock. What I used to run in my featureless rifle. Affordable, sturdy, and there’s no questioning that it is fixed. Very standard A2 buttstock for a more retro look and with storage compartments. 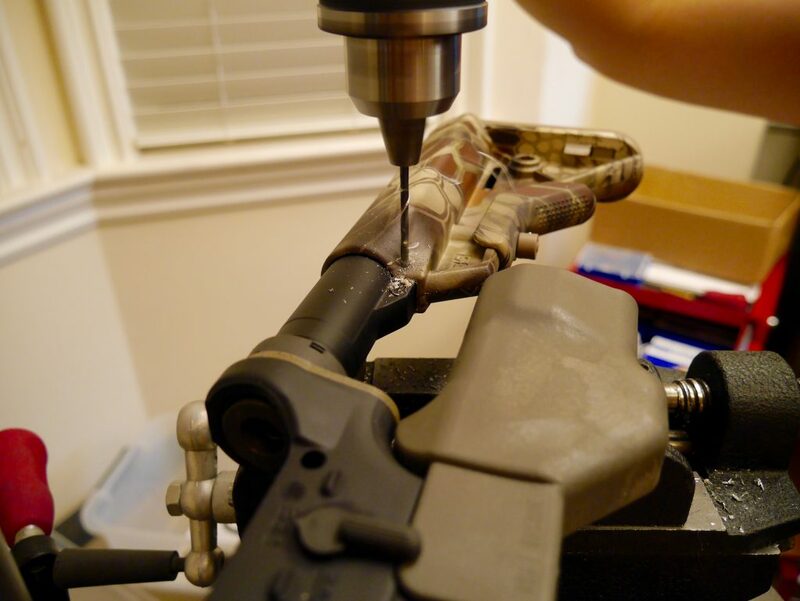 If you really love your current buttstock or really want to save money, you can go ahead with blind pinning and epoxying your buttstock. All it takes is drilling through the buttstock and some of the buffer tube, putting in a roll pin, and epoxying it over. Some people even do it on both sides as an extra measure. 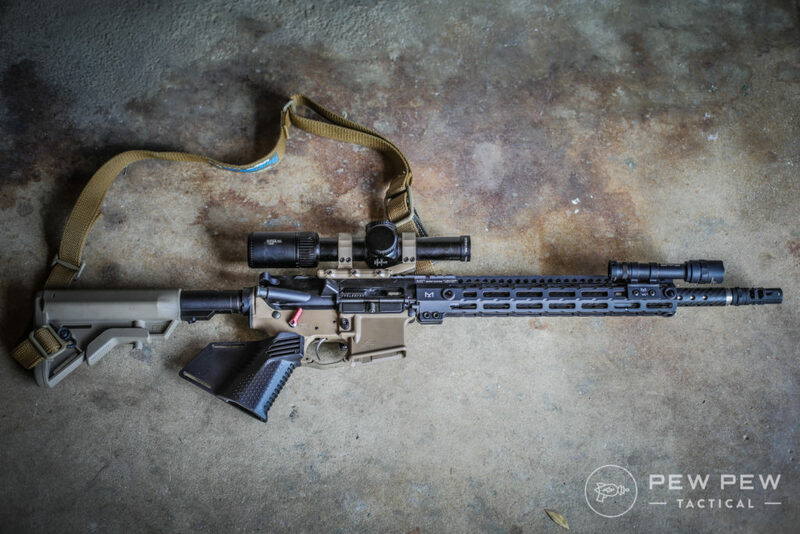 I detail what I did for a new build here: How to Blind Pin an Adjustable Stock. 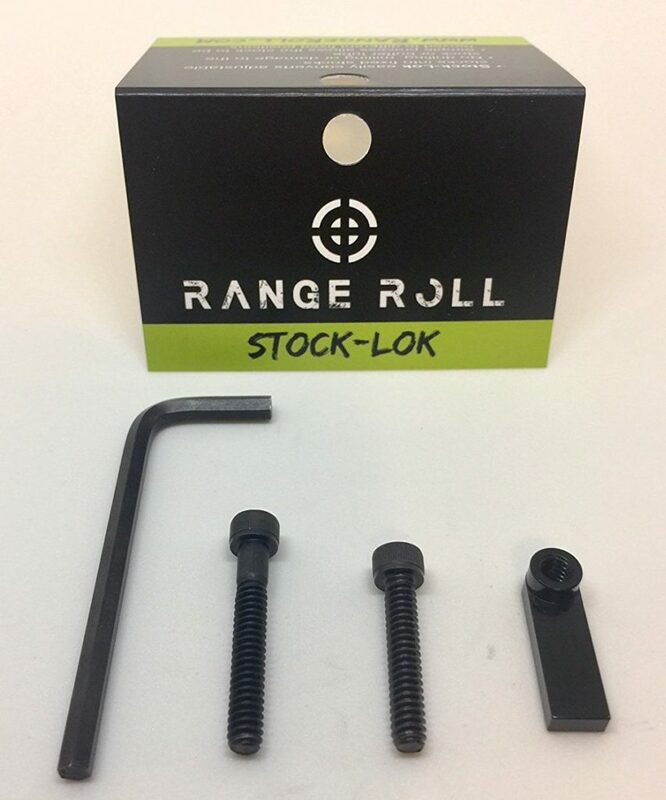 The Stock Lok is something new has come out that swaps out the spring-loaded adjustment pin for something fixed. More expensive at $35 but you don’t need to drill and pin. The newest thing out is the Stock Stop from Strike. You cut a rubber piece so that it fits your buffer tube and only shows one hole. And slip on your regular stock until it clicks in that hole. Only thing is you can’t select a custom length since there’s that stopper in the front. Make sure the 2nd to last hole works for you. Need more stocks…especially now that you can use the Stock Stop? 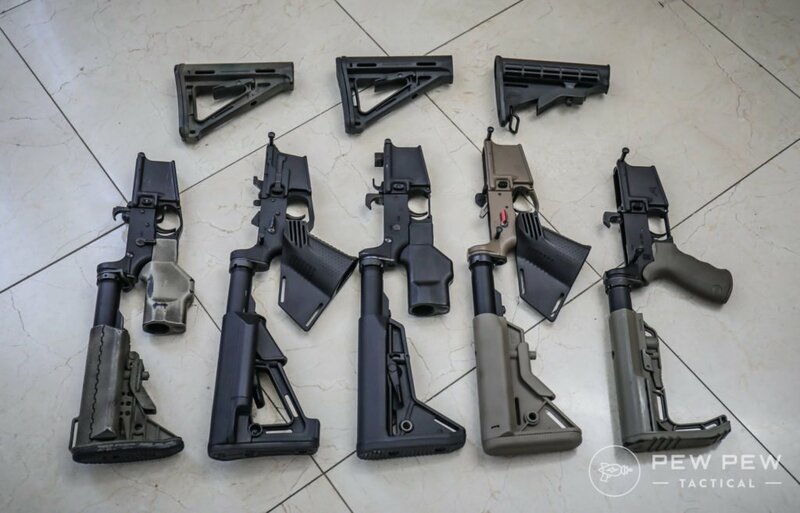 Check out the rest of our favorite AR-15 Buttstocks where we rate them based on weight, price, and of course…cheekweld. These last three are easy to take care of…just don’t have them! 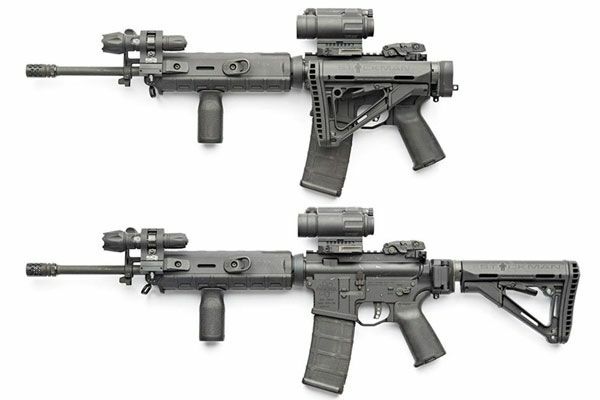 There’s some debate on whether or not the Magpul AFG is considered a forward pistol grip, but again…I’d just be safe and not have it. Current law makes it ok if your magazine is fixed and the upper/lower receiver halves are opened up in order to release the magazine. The best “new” bullet button I like is the AR MagLock + Patriot Pin. Pretty easy to install (especially if you’re building) and really quick mechanism to release the rear due to the Patriot Pin. 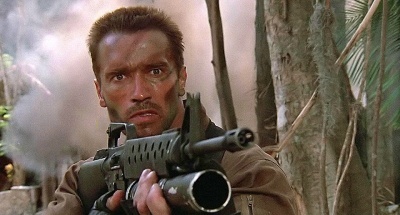 And here it is in action for a tactical reload. Regular empty mag reloads take a little longer you’ll see in the review. So there you have it, how to make a “featureless” AR-15 or other rifles in California/New York. 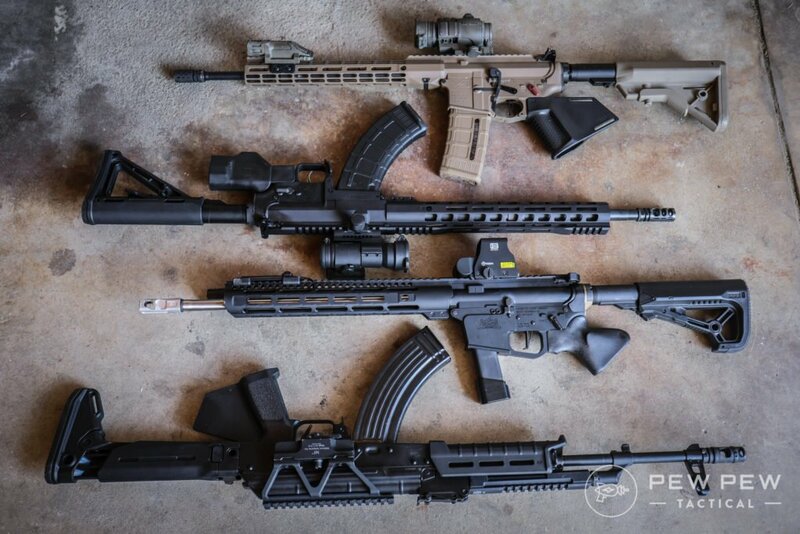 Want more of our best guns and gear? 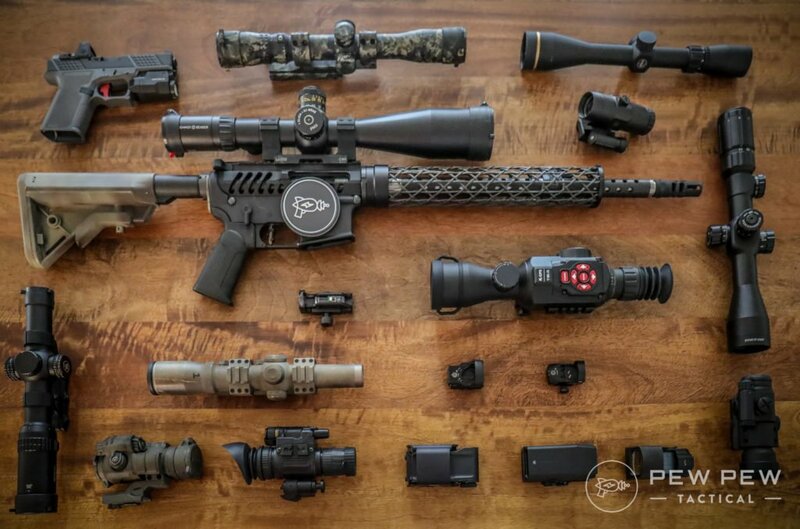 Check out our Best AR-15 Upgrades and Best AR-15 Scopes & Optics. 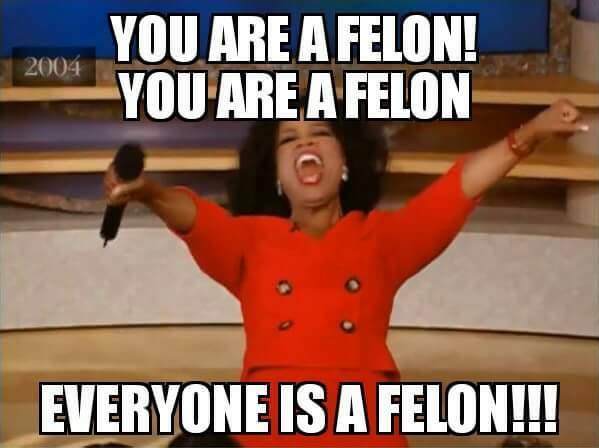 I heard that the Stock Stop was not CA legal. There is no official determination either way – however, as Strike understands the law it should be in compliance. Interesting article. Kinda dumb laws. I get the point of reducing concealability or mag size / increasing reload time COULD arguably impact public safety, but I’m not sure how eliminating features like pistol grips and flash suppressors make people safer. Oprah IS racist, using her mug isn’t racist. It simply mocks her ignorance. A billionaire black female in a racist country. Who would have thought? Does anyone know of a California compliant magazine release for the Spike Glock 9mm lower? I am moving to Ca and need to get myself legal or change my weapon to featureless. I don’t think I’ve seen anyone offer any kind of fixed magazine option for 9mm lowers, personally, my AR-9 is featureless. Sorry! I was told that if I build a featureless rifle, the muzzle brake needs to be pin and welded on. Even though the barrel length is already 16inches and the over all length of the rifle is over the 30inch mark. Is that true is, or it just fear spreading. For California that is incorrect, a muzzle brake or compensator does not have to be permanently attached. I believe for either NJ or NY it does – that is where the confusion stems from. But I might be wrong on the second part. Ya, I’m in California so that’s some good news to hear! Thanks David! !